Manchester is one of the biggest UK cities, it’s well-known for Coronation Street, Feminism, the football team famous around the world, and many other things. The city was named the most livable place in the country in 2015. Those are pretty convincing facts for anyone thinking about moving to Manchester, but in case you need some more convincing here are 13 reasons why the city of Manchester is one of, UK’s best. This city is home to two of the biggest clubs in the world, Manchester United and Manchester City, with hundreds of awards between the two clubs. It is also the home to one of England’s most renowned test venues at the Emirates Old Trafford cricket ground. The Commonwealth Games have left the city with world-class facilities, built to host the event. With more then 80,000 students, Manchester has one of the largest university populations in Europe. Manchester University has had 25 Nobel Prize winners among its staff and students past and present (after Oxford and Cambridge). Despite the competition with cities like London, the northwest city now boasts the fastest-growing food and drink scene in the country, with new restaurant and bar openings outstripping everywhere else, including London. The Whitworth was named museum of the year in 2014. After a £15m transformation, the Oxford Road art gallery has welcomed record visitor numbers through its doors since reopening. The imperial War Museum North and the Museum of Science and Industry among others also register records breaking number of visitors. Numerous UK rock/pop legends came out of Manchester, legends like The smiths, Oasis and Joy Division, Manchester’s music scene is a major stop point for the UK gig circus and its venues regularly host global superstars as well as up-and-coming acts. The Manchester Arena is one of the largest indoor music venues in Europe and has set the stage for shows by everyone from Madonna and Prince to Take That and Kylie Minogue over the last 20 years. European cities are getting more and more expensive each day, so being able to live in a city where 60% of your income goes to pay rent is a blessing. Money goes much further up north the houses in Manchester are four times cheaper than in London. Manchester has the third busiest airport in the UK after Heathrow and Gatwick, with direct flights to everywhere from Dubai to Hong Kong. Well connected by train, Metrolink and motorway, making it easy to go on holidays and it’s important for business and economic benefits. The city is lucky enough to have the beauty of the Peak District at its doorstep and the Lake District is also within reach. Alternatively there are plenty of parks inside the city like Dunham Massey. Manchester is the only place someone can obtain a ‘mummy studies’ degree with the study of Egyptian a mummies. You can look to save or spend money in the high street brands of the Arndale Centre, the New Cathedral Street or the Exchange Square. The city also has the largest shopping centres in Europe at Trafford Centre. The rave spirit is alive in Manchester at clubbing institutions like The Warehouse Project, which brings some of the biggest names in dance music to the city for 12 weeks every year, and Sankeys, which has just announced a five-year run of events at Victoria Warehouse. For more classy night outs you can go to Deansgate and Spinningfields which offers chic champagne and cocktail bars plus aplenty of celeb-spotting opportunities. In terms of cash there is no contest that Manchester is the second city in the UK. This city is the fastest growing British Economy outside of London with a GDP of £28 billion. Manchester is renowned as being the birthplace of the Industrial Revolution in Britain and subsequently Europe and the world. The transition from hand-made to machine-powered saw an unprecedented explosion of new ideas and increase in the industrial and urbanised country. 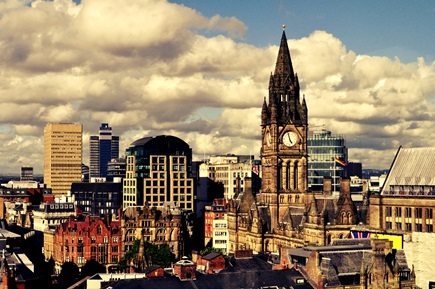 If you are planning to visit Manchester this summer then get a quick QUOTE today!